The various mortgage programs offered under the approval of the United States Federal government have some type of fee. FHA, VA, and USDA all fall into this group. This article will explain the fee charged by USDA and how it is used. All borrowers that have a USDA loan are required to pay an annual fee. The amount of the fee is added to the monthly payment amount, similar to the funds that are designated for property taxes and home insurance. The fee amount that is paid each month will change from year to year. Since the annual amount is based on the outstanding loan balance, it stands to reason that the fee should decline over time. With a typical loan, more money is earmarked towards interest than principal for the first several years. For this reason, the amount of the annual fee does not decrease significantly from year to year. However, over the course of time, as more and more of the monthly payment pays down the principal, the annual fee will begin to decline. Since October 1, 2016, the annual amount has been 0.35% of the outstanding loan balance. This amount is divided into 12 payments. The $62.71 will be added to the normal principal & interest payment for the mortgage, along with the escrow, and this will be the new payment for the following 12 months. The following year, a new calculation will be performed with the new loan balance. Some people mistakenly compare the annual fee to private mortgage insurance premiums. There is a major difference between private mortgage insurance and the USDA annual fee. Private mortgage insurance premiums are ONLY charged to a borrower if the mortgage loan amount is 80%, or more, of the home’s appraised value. If the borrower pays 20% down at the time of purchase, they will not pay the private mortgage. Furthermore, if the borrower pays the loan balance down below 78% of the appraised value, the private mortgage premium will be removed from the loan payment. This is not the case with the annual fee. The annual fee is paid by all USDA borrowers for the life of the loan. The funds are used to provide money to USDA to help pay off loans in which the borrowers default. Since USDA allows a 100% loan to value loan, and they are willing to approve borrowers with less than perfect credit, they are taking on more risk compared to other loans. This risk comes at a price. People that wish to remove the annual fee from their USDA mortgage will need to refinance the loan to a different type of mortgage program. Keep in mind that if the new loan amount is at 80% of the home’s value that private mortgage insurance will be charged. It is a good idea to wait until the balance of the loan is well below the 80% threshold before considering a refinance. The USDA program will also charge an up-front fee for all new loans. Currently, the charge will be 1% for all new purchase loans at least until the end of 2018. A refinance loan will also incur the 1% up-front fee. USDA allows homeowners to add this fee to the total loan amount rather than forcing them to pay it out of pocket at closing. In a perfect world, the USDA program would allow borrowers to finance their homes without the added fees. However, bad things can happen and force people to seek other living arrangements. The annual fee and the upfront fee allows USDA to have the funds necessary to cover these negative situations and continue to offer these attractive loans to worthy individuals across the country. 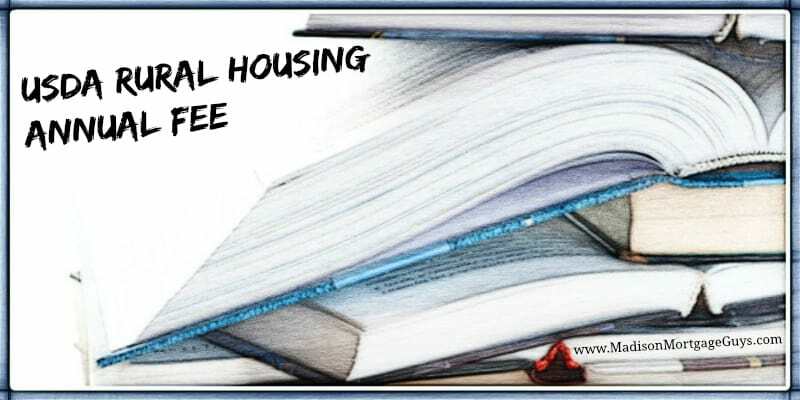 The FY 2018 fee structure is applicable to all Conditional Commitments (Form RD 1980-18, “Conditional Commitment for Single Family Housing Loan Guarantee”) issued by Rural Development on or after October 1, 2016. Conditional Commitments issued by Rural Development prior to this date are not subject to the new fee structure.